In the spring of 1978, Marky joined the Ramones. In a matter of weeks he was in the studio recording his first album with The Ramones entitled, “Road to Ruin”, which features one of the biggest Ramones songs “I Wanna Be Sedated”. The following year the Ramones filmed the cult classic “Rock ‘n’ Roll High School”. Later that year, they joined forces with producer legend, Phil Spector to record “End Of The Century”. 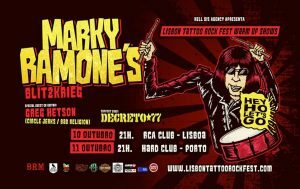 Marky Ramone BlitzkriegIn the spring of 2009, Marky launched his first worldwide clothing line with long time friend Tommy Hilfiger. In 2010, Marky shared his recipe for pasta sauce by introducing Marky Ramone’s Brooklyn’s Own Pasta Sauce. In February 2011 The Ramones received a Grammy Lifetime Achievement Award. It was the first Grammy for the punk rock pioneers. Marky is currently in his seventh year as a D.J. on Sirius/XM Satellite Radio, hosting, ‘Marky Ramone’s Punk Rock Blitzkrieg”. Marky has also appeared on numerous TV shows including, The Simpsons, Anthony Bourdain’s “No Reservations and ZRock.